Competition is heating up in the global thin film drug manufacturing market owing to astute players betting big on new products by investing heavily in cutting edge research and development. Expanding of production facilities to satisfy the ever-surging global demand is another strategy being deployed by them. To thrive in the challenging environment, players are also seen banking upon mergers and acquisitions to tap into the synergies. This is resulting in consolidation in the global market for thin film drug manufacturing. Indivior Plc., MonoSol Rx, IntelGenx Corp., and ZIM Laboratories Limited are to name a few companies that have reached a place of prominence by banking upon the aforementioned strategies. 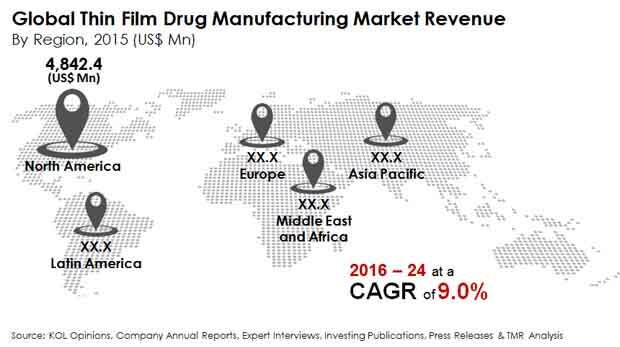 A recent research study by Transparency Market Research finds that the global market for thin film drug manufacturing will likely become worth US$15.984 bn by 2024 by rising at a solid 9.0% CAGR between 2016 and 2024. It valued the market at US$7.338 bn in 2015. Among the different types of thin film drug manufacturing, the oral thin film is expected to gross maximum revenue in the next few years. This is because of its myriad benefits such as ability to administer drugs via the oral mucosa, ease of handling and transportation, ability to eliminate the hepatic first pass effect, and early action. The segment is expected rise at a phenomenal two digit CAGR of 18.3% during the forecast period. From a geographical standpoint, North America, powered by the U.S. where superior pharmaceutical research and growing demand of novel drug delivery is maximum, leads the market. So much so, the U.S. held about 85.3% market share in 2016. Developed European nations and the U.S. are at the forefront driving sales in the global market for thin film drugs on account of increased awareness about their solid efficiency in bringing about necessary therapeutic results and their ease of usage. Another reason why their demand in these nations is soaring is because of the absence of drawbacks of conventional forms of dosages in such novel products. Those include complicated administration and reduced bioavailability. On the contrary, they help administer appropriate dosages for the exact outcome. All such factors are catalyzing growth in the global market for thin film drug manufacturing. “Continued research and development, especially of innovative polymeric thin films, is also having a positive impact on the market,” adds the lead analyst of the report. A trend observed in the market for thin film drug manufacturing is key players looking towards the under-tapped emerging markets, particularly in Asia Pacific. India, Japan, and China hold out a lot of promise and overall, the region is expected to be buoyed by unveiling of new products, rising awareness, and supportive regulations.